“Without our ‘volunteer family’ and their support at harvest time, festivals and special events, we couldn’t have made it to the 3rd year, much less 30,” he said. 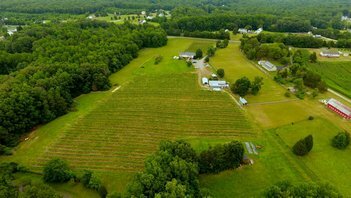 Just about thirty minutes northwest of Fredericksburg, Hartwood Winery sits in the rural western stretch of Stafford County, outside of the suburban sprawl that rings Washington, DC. Here, Jim talks about the Virginia wine community back in the day, how Hartwood came to be, and what he’s most proud of. I came to Virginia in the late ‘60s, from Tennessee, to teach in Prince William County Schools. My mother had grown grapes. When I got to Fredericksburg, we enjoyed wine tasting and helped form a wine society. We met, back then, at the Virginia National Guard Armory, at the corner of Route 1 and Route 3. We would do tastings there and also grill in the parking lot. It was a different world. One evening, Lucie Morton (now an international wine consultant) came to speak to our Fredericksburg Wine Society. She had recently traveled and studied in France to learn about making wine. She was also associated with the Flemer family’s newly established Ingleside Winery [on the Northern Neck]. 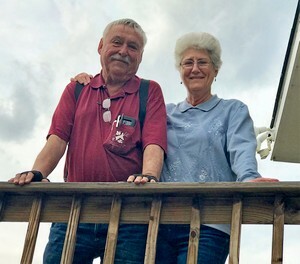 Lucie announced that she was going to start growing grapes at her family’s estate on the Potomac River and she asked for volunteers to help – and I raised my hand. I got totally hooked and the grapes grew well at the estate. So I kept volunteering, and helping, and learning throughout Virginia. I learned enough to grow some grapes locally. In the meantime, the state of Virginia became involved. People across the Commonwealth began their experiments with growing grapes, and several vineyards started cropping up. I got involved in meetings of these Virginia wine pioneers, who were mostly women. In the early ‘80s, the first organized “meeting” of the growers took place. It was about a dozen people, again mostly women, who met under a little gazebo at Meredyth Vineyards in Middleburg [now closed]. We all brought wines to taste and information to share with each other. That little group became the Virginia Vineyard Association and the Virginia Wineries Association. We continued to help each other, sharing information and meeting frequently to become better grape growers and wine makers. Remember, this was all before the internet. But we would call each other and share our success and failures. Early on, the more I learned the more I wanted to know. Everything about winemaking became a passion. I would think, hey, I’m a school teacher and yet have this incredible opportunity to do something totally new…and I have a built-in customer base. Teachers drink a WHOLE LOT OF WINE. I planted DeWeese [Vineyard] in 1972. I put out five varieties to see what would grow, because nobody knew anything - we had no idea if anything would really grow well here. Then I bought Hartwood, and in 1980 we brought three of the five varieties over from DeWeese. In 1989, Hartwood Winery opened, and we began making the wine from the grapes we grew on site. To expand my wine offerings, I was able to purchase some different grapes from other nearby vineyards. Currently we grow Vidal, Seyval and Chambourcin at Hartwood. We settled on those because they are heartier grapes and can sustain a harsher Virginia climate, and yet make reliably decent wine each year. Our first bottling was a Rappahannock Series – Seyval, Vidal and Chambourcin. We held an opening day festival in June 1989 – had 76 cases and sold out in a few hours. Had to work all night to label more bottles for the next morning so we could open and have something to sell. My proudest moment was when we won an international Double Gold in 1993 for our Winter Lord Cabernet. Beyond that, it’s more an all-the-time feeling – knowing that we have been successful – in spite of starting this career while being a full-time teacher. My day job didn’t allow me to fully participate in the profession, attend meetings and all that. But I could still grow my knowledge and could try different things and be a pioneer with the other new vineyard owners and wine makers. Hartwood succeeded, despite my constraints, and we made some decent wines and developed a loyal following. The wines in Virginia have certainly improved. The industry has grown from 30 to [approximately] 300 wineries. Even though there are 10 times more wineries – many now with large event venues and extravagant multimillion-dollar facilities – we are still having new visitors enjoy our wines. There is still room for the authenticity of a smaller Virginia farm winery like Hartwood. We are authentic, we grow the grapes right here, and we produce the wines just below the tasting room. We are smaller now than most, but people are still looking to learn about the wine making and we can deliver that – because we do it all – first hand. I’ve now retired from Prince William County School system. I was a school librarian for many years. My wife Beverly was also with the Prince William system. We are now full-time grape growers and wine makers. There is today a wealth of information from the state of Virginia. It is out there and easy to retrieve. All the resources, all the knowledge, it is so easily at hand. The legacy of our early work has been preserved – mistakes included – and passed along to make better wine and grow successful vineyards. We have done our jobs – and we are proud of what we have done along the way to grow this industry that is now so important to Virginia. We are still here after hurricanes, droughts, deer and environmental challenges. I'm proud that we make our own wines and our own decisions. We are proud to sell what we grow – we’re still making it with our own hands, on our own land.